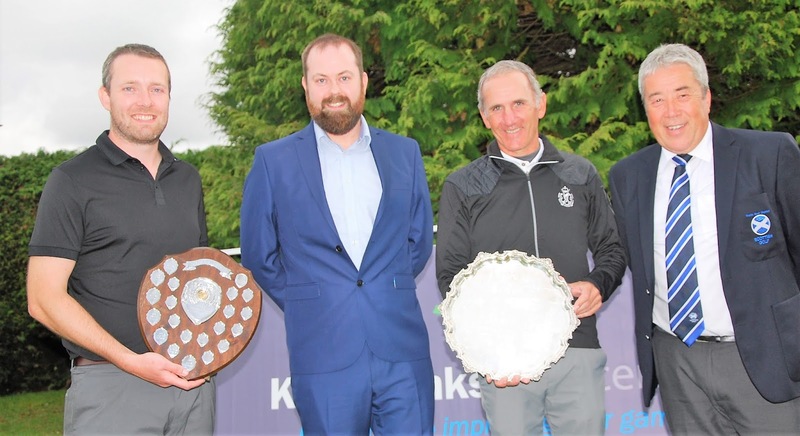 Left to right: Mark Thomson (Kintore), best performance by a NE player, Chris Law (representative of tournament sponsors Kings Links Golf Centre), Euan McIntosh, the new North-east District Open champion, and David Fleming, president of the NE District. Picture by Cal Carson Golf Agency. Scottish amateur champion Euan McIntosh (Turnhouse), 50 on his next birthday, wore down Kintore's Mark Thomson in a titanic struggle over the final round of the 72-hole North-east District Open championship, sponsored by Kings Links Golf Centre, at Aboyne Golf Club today (Sunday). Both players produced their Sunday best in the fourth round - four-under-par 64s, former professional McIntosh winning the prestigious title with a nine-under total of 263 and Thomson finishing runner-up on 265 to win the trophy for the highest-finishing North-east player. "I got the breaks, Mark didn't," said McIntosh. "I holed more long putts on these superb greens over the four rounds than I have done in any event since I returned to the amateur ranks. "This was the fifth tournament I've won since I've made a comeback (the Scottish title and four 72-hole competitions) over the past couple of years but Mark deserved at least a dead-heat! He played a stormer." McIntosh, after scores of 69, 64 and 66 for 199, was two ahead of Thomson (68, 66 and 68) with 18 holes to play and when the Edinburgh man reached the turn in five-under 29 to lead his rival by three it looked all over. But McIntosh had uncharacteristic back-to-back bogeys at the 10th and 11th … and the Battle of Aboyne was "on" again with a vengeance. Thomson drew level with a birdie at the 13th but there was a decisive two-shot swing in McIntosh's favour when he birdied the 17th and Thomson bogeyed it. Both players birdied the final hole to provide a fitting end to a quality performance by both men. McIntosh, who has won the North-east champion of champions competition in the past, looks set gain his first NE District team honour in the line-up to defend the Scottish area title. Adam Dunton (McDonald Ellon), 69-69-65-69, and former Cruden Bay player Stephen Roger (Peebles), 67-69-69-67, finished joint third on 272. Matthew Clark (Kilmacolm) had an outward half of 29 in his final round of 64.